New York City offers hundreds of hotel options for business travelers, from high-end, high-price boutique hotels to mega-meeting hotels. Like visiting almost any city for business, it’s important for business travelers to stay in a convenient place, either in the center of the city or close to where they have meetings or will be doing business. With its central location, multiple services, and brand new facilities, the Hyatt Centric Times Square, New York is a great option for business travelers heading to New York City. The Hyatt Times Square is just steps from Times Square (but still quiet and comfortable on the inside), has modern rooms with floor-to-ceiling windows, good-sized bathrooms, and an on-site restaurant and rooftop lounge. 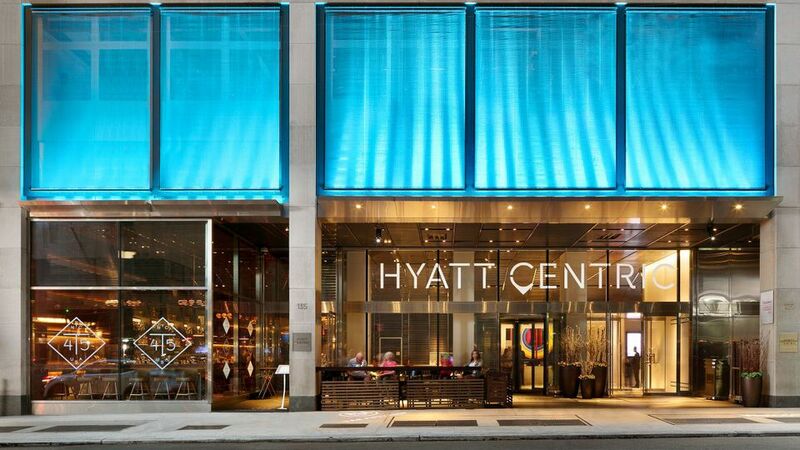 The Hyatt Centric Times Square is a great option for NYC-bound business travelers that want an upscale, but affordable, lodging option that’s convenient to the center of the city. The Hyatt Centric Times Square is a brand-new (as of 2014) mid-sized hotel in the heart of New York City, near Times Square. The hotel has 487 guest rooms spread out over 54 stories, including a range of suites. The hotel is just steps away from the heart of Times Square, but it’s on a reasonably-quiet street, so that you definitely can get a break from the outside world. A number of comfortable Irish pubs and other restaurants are right up the street. During my stay at the Hyatt Centric Times Square, New York, I found the room very comfortable and quiet. The elevators worked well and fast, there was minimal or no noise from either the hallway, nearby rooms, or outside. Rooms are reasonably-sized (for New York), starting at 325 square feet. The hotel has a range of nice design features, from miniature lights over each room’s door (making it easy to find and use your key) to thoughtfully-designed showers, bathrooms with plenty of space, to a reasonable number of storage spaces, hooks, and convenience items. The hotel also has a rooftop bar and lounge, with spacious windows and views onto Times Square. Concierge services are available in the lobby, as is a business center with computers and a printer. The hotel has a good-sized fitness center, as well as a 4,200 square foot spa, offering a wide range of treatments, massages, and services. My room featured a very comfortable king bed and a nice side-view of Times Square through the floor-to-ceiling windows. The window drapes blocked the light out well, while the AC system did its job correctly. More upscale and modern than many traditional business hotels, the Hyatt Centric Times Square definitely has its own “designer feel.” Rooms feature New York City-inspired artwork, urban upscale furniture (with some thoughtful touches like a convenient hooks, a comfortable lounging chair, and a small bench), and electronically-controlled lights. The room's desk had plenty of power connections, and a convenient media hub for connecting digital devices to the television. While the desk was nice, the desk chair wasn't--instead of an ergonomically correct chair that you could use for hours, the room had a trendy, but slippery, curved chair that would make it difficult for work for long periods of time. Room amenities include: robes, walk-in showers, hairdryers, irons and ironing boards, refrigerators, coffee makers, large-screen TVs, windows that open, in-room safes, and more. In addition to its range of standard rooms, the Hyatt Centric Times Square also includes a number of specialized suites available for an additional price. While the Hyatt’s bathrooms aren’t overly large, I would consider them spacious by New York City standards, where they’re typically wedged into the floor plan with minimal regard for the user. By contrast, the Hyatt’s bathrooms were well-designed, comfortable, modern, and practical, with enough space so that I didn’t feel claustrophobic. The Hyatt Centric Times Square has on-site restaurant that’s open for breakfast, lunch, and dinner. The T45 Midtown Diner provides “comfort food with a modern twist.” While the morning I had breakfast there I found the service somewhat slow, the food was good and it’s especially convenient for business travelers who need want to grab breakfast, lunch, or dinner without heading outside. In addition, travelers can order ready-to-go meals or snacks for pickup or delivery to their room. The Hyatt Centric Times Square also has a rooftop lounge that offers excellent views of the New York City skyline. The lounge is a great place to sneak away from the busyness of Times Square for a relaxing drink or snack near the lounge’s fireplaces or outdoor terrace. Like any decent travel hotel, the Hyatt Centric Times Square also has a fitness center, one that’s good-sized and has nice floor-to-ceiling windows for a view out to New York City. Unlike many other similar hotels, the Hyatt Centric Times Square has a 4,200-square foot spa. The spa area offers a surprisingly relaxing vibe for something in the heart of New York City. It provides a range of services, from massages to manicures and pedicures and more. The hotel provides valet parking for a fee (but travelers can also self-park on their own at nearby parking garages). While not a massive, mega-meeting hotel, the Hyatt Centric Times Square does have meeting rooms and facilities, and offers business travelers a unique location for small-to-medium-sized business events. The hotel has 8,000 square feet of meeting and event space, including a 2,000 square-foot ballroom and a 1,400 square-foot terrace for outdoor events. Part of the attraction to meeting at this hotel would not only be the modern, upscale furnishings of the meeting rooms, but the hotel’s central location, near the theater capitol of the world. In addition, the hotel can provide audio/visual equipment and services. The hotel has a total of six meeting rooms, the largest of which is its 2,000 square-foot ballroom. In addition to the 1,400 square-foot terrace on the second floor conference area, there’s also a 1,000+ square foot terrace on the 54th floor, adjacent to the hotel’s rooftop bar.